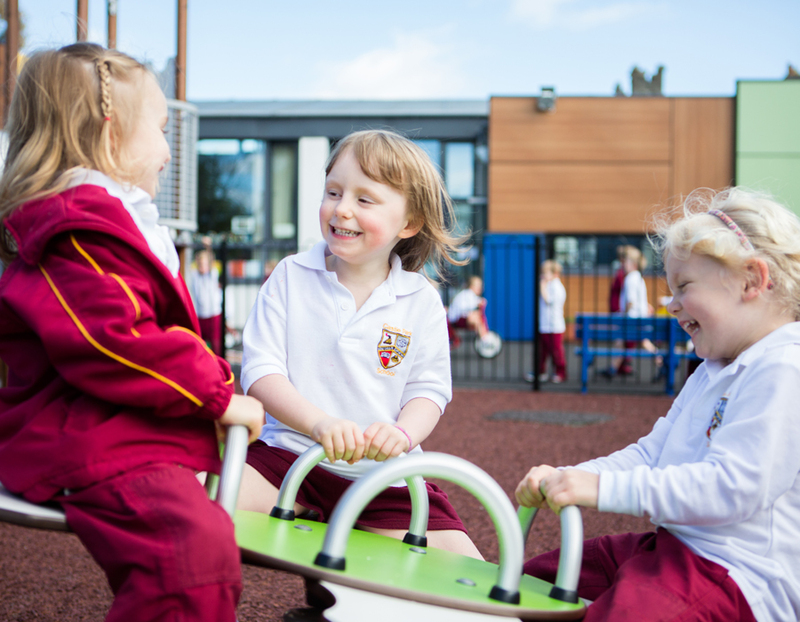 We welcome children from age 3+ into the Pre-Prep Department. Class sizes are small with two classes per age group catering for 3+ year olds (Pre-Prep 1), 4+ year olds (Pre-Prep 2) and 5+ year olds (Pre-Prep 3). In Pre-Prep 3 pupils are prepared for the transition to the Prep Department. Eligible children in Pre-Prep 1 and Pre-Prep 2 may avail of the ECCE scheme. The Head of Pre-Prep manages the day-to-day running of the Department, including curriculum, pastoral care and admissions. The Deputy Head of the Department teaches in every classroom and assists the Head of Pre-Prep with administration duties. Each class is taught by a suitably qualified and experienced early years teacher who is supported by classroom assistants, who are also qualified teachers. Our fundamental philosophy of early years’ education is founded on a carefully planned yet rigorous play-based approach to learning. While we teach the Irish Primary Curriculum for Junior (Pre-Prep 2) and Senior Infants (Pre-Prep 3), we also include aspects of the Montessori teaching methodology, using Montessori materials. Dialogue or talk, active engagement in tasks and freedom to explore topics in depth are seen as vitally important to engage all children in exciting, age-appropriate, learning activities. Topics or themes change roughly every half term and might include, for example, “All About Me”, “Space”, “Mini Beasts” or the “Fairy tales”. Open-ended themes are refined within each classroom depending on the interests and abilities of each group. Pupils are encouraged to follow their particular interests and to use technology to supplement their learning. Activities in pairs, threes or other groups are seen as critical so that pupils are encouraged to verbalise their thinking process, thereby enhancing cognitive development as well as improving social skills. Reading is introduced on an individual basis when children are ready. Most days adults hear the children read in class, and each child is given reading materials as “homework” so that school and home can work together to inculcate this essential competence. Pre-Prep children have regular access to the School’s Parker Library, where there are numerous resources to help motivate our pupils to become interested in literacy. Music is an important subject, and all of the children attend weekly lessons in our superbly equipped Music Room with the Director of Music. They not only take part in choral activities but are introduced to instruments starting with percussion and moving onto the recorder in Pre-Prep 3. Children in Pre-Prep 2 and 3 can sign up for individual music tuition with members of our peripatetic staff. Pupils have regular access to our ICT suite, including our new robotics centre, and benefit from access to a class set of iPads as required to enhance learning resources within their own classrooms. Sporting and outdoor activities play a very important role in our early year’s curriculum. All Pre-Prep pupils avail of our extensive sports facilities and attend a weekly PE session with our specialist teachers in the Sports Hall. Pre-Prep 2 and 3 pupils benefit from a weekly swimming lesson in our 25m swimming pool (Pre-Prep 1 children, over the age of 4, may avail of swimming lessons run separately by the Castle Park Swim Academy at weekends). Our Forest School programme offers the children in Pre-Prep 2 and 3 opportunities to develop confidence and self-esteem through hands-on learning experiences in a natural woodland environment. These lessons include activities to raise environmental awareness as well as nature walks for all children in our grounds at the front of the Castle. Pupils are educated in bright and spacious classrooms, each of which leads directly to a secure playground. Outdoor playtime is enhanced by a selection of construction materials, bikes and trikes along with the use of the Adventure Playground. Adjacent to the classrooms and playground is Day Care which offers a comfortable and relaxing space for before and after-school activities. The Pre-Prep day begins at 8:50am, but if parents need an earlier start, pupils can be supervised from 8:00 am in Day Care. Registration is usually followed by circle time where pupils are encouraged to share their news and discuss various themes and topics. Class time continues until 10:25am when a snack is followed by playtime in the playground until 11:05am. Pre-Prep 1 children finish school at 12:30pm. Pre-Prep 2 & 3 have a hot lunch in the Dining Room at 12:20pm and their day finishes at 3:15pm. Educational outings take place during the school year, including environmental trips, visits to the theatre and the farm or zoo. Guests from organisations such as the Fire Brigade and the DSPCA come to school to talk to the children about topics such as safety, animals and nature. Our school year of 170 teaching days is divided into three terms. The Autumn term runs from the beginning of September to December (Christmas); the Spring Term from January to Easter and the Summer Term runs from after Easter until the end of June. There is a two-week mid-term break in the Autumn Term and a one week break in the Spring Term. Term dates are published well in advance and may be consulted here. Performances of Harvest, Nativity, Spring and Summer concerts are regular features of the annual Pre-Prep calendar and are very popular with parents and family members. Pupils may reserve a place in Day Care on a daily or weekly basis following the end of their teaching day. Places are limited and a booking form and fee schedule are issued to parents annually. There is some flexibility in collection times and a hot meal is provided at 1:50pm and 5:00pm for those children present. During the holidays and mid-term breaks, activity camps are offered at the Swim Academy for children aged 4 to 12 years. These offer a wide range of indoor and outdoor sports together with a variety of games, arts & crafts, treasure hunts and other fun activities.